27 June 2018: We moved in the neighbourhhod! Since June 27th our home is the new Biozentrum I, which officially opened June 25th, some hundreds of meters away from the IMB. 22 March 2018: Ever wondered about where pizza fits in the tree of life? Find out now in this paper (published in the Annals of Improbable Research) where we helped Russ Hodge to define The Evolution of Pizza. 20 November 2017: we celebrated the 3rd Challenges in Computational Biology meeting: Protein Interaction Networks and Disease, organized by Gregorio Alanis (JGU-Mainz), Jean-Fred Fontaine (JGU-Mainz), Spyros Petrakis (CERTH, Thessaloniki, Greece) and Miguel Andrade (JGU-Mainz). 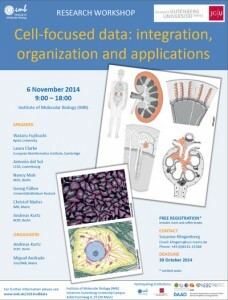 Stay tuned for the 4th Challenges in Computational Biology meeting. 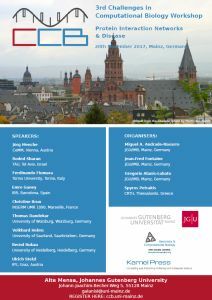 16 August 2017: NYCE, to predict the subcellular location of proteins based on their sequence, is back now at JGU-Mainz. Isn't it NYCE? 14 February 2017: PESCADOR, to extract interactions from PubMed abstracts, is back and kicking at the University of Luxembourg. 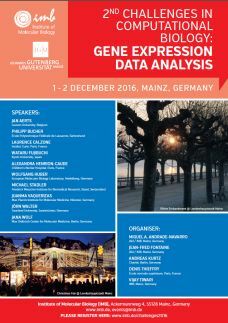 10 January 2017: mBison, our tool to calculate enrichment of miRNA targets on gene sets from ChIPseq is back at JGU-Mainz. 1-2 December 2016: we hosted the 2nd Challenges in Computational Biology meeting: Gene Expression Data Analysis, organized by Jean-Fred Fontaine (JGU-Mainz), Vijay Tiwari (IMB), Andreas Kurtz (Charité, Berlin, Germany), Denis Thieffry (École normale supérieure, Paris, France) and Miguel Andrade (JGU-Mainz). 11 April 2016: ARD2, our tool to predict alpha solenoids from protein sequences, has been moved now to JGU-Mainz. 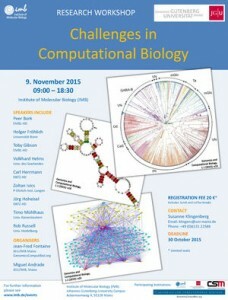 9 November 2015: we hosted the Challenges in Computational Biology Workshop, organized by Jean-Fred Fontaine and Miguel Andrade (JGU-Mainz). 18 September 2015: The first issue of Genomics and Computational Biology is online. Genomics and Computational Biology is a peer-reviewed and open-access journal directed by Dr. Fontaine. It publishes original Research, Tools (software and databases), Benchmarks and Analytical workflows. You can help the community by joining the Editorial board or by submitting your work. 1 Sept. 2015: New version of HIPPIE available. 20 April 2015: the mBISON tool to find enriched miRNA targets in sets of genes from ChIPseq is out there! 15 April 2015: We are migrating our web tools to the JGU with the kind help of the university IT department. See K2D2 and K2D3. 19 March 2015: We are preparing the first issue of a new peer-reviewed and open-access journal, Genomics and Computational Biology, a project of Dr. Fontaine. We publish original Research, Tools (software and databases), Benchmarks and Analytical workflows. You can help the community by joining the Editorial board or by submitting your work (focus on the content, not on text formatting)! 1 Sep 2014: the group moved from the Max Delbrück Center for Molecular Medicine in Berlin, Germany. Our web pages there will stay up for a while. Many of our tools are still kindly hosted at MDC. 6 November 2014: We hosted the workshop on Cell-focused data: integration, organization and applications, organized by Andreas Kurtz (BCRT-Berlin) and Miguel Andrade (JGU-Mainz). 8 May 2014: we have two new servers out: Alkemio to find chemicals associated with biomedical topics and FASTA Herder to cluster sequences by similarity. 14 January 2014: you can use CAFE to detect and visualize chromosomal abnormalities from DNA microarray gene expression data. 23 November 2013: NYCE becomes available to predict the subcellular location of eukaryotic proteins based on their sequence. 11 October 2013: HIPPIE version 1.6 is out. Query all experimentally known interactions between human proteins; now 40,000 more are available! 30 September 2013: you can try ARD2, to find alpha-solenoid repeats on protein sequences. 27 September 2013: uORFdb, a literature database on upstream open reading frame (uORF) biology, is available for public use. 12 September 2013: Web services were interrupted for a short time due to scheduled maintenance work. 17 October 2012: CellFinder's body browser is available for public use. 3-8 September 2012: the EMBO course "Computational analysis of protein-protein interactions for bench-biologists" was organized at MDC by Aidan Budd, Toby Gibson, Denis Shields, Michaela Herzig and Miguel Andrade. 18-20 June 2012: Our computational equipment was moved to a new computer room. 20 April 2011: The Evolution Workshop 2011 organized by David Fournier happened at MDC. A short report of the event can be found here.